Government of India has replaced the old planning commission started in 1950 with a new institution called NITI Aayog on 1 January 2015. It works under the chairmanship of Prime Minister. NITI Aayog (National Institution for Transforming India) will seek to provide a critical directional and strategic input into the development process. It focuses on co-operative federalism. What’s new with NITI Aayog? NITI Aayog = more a “think tank” than a finance distributing agency. NITI Aayog will provide Governments at the central and state levels with relevant strategic and technical advice across the spectrum of key elements of the policy. The NITI Aayog will create a knowledge, innovation and entrepreneurial support system through a collaborative community of national and international experts. The National institution for Transforming India will act as a catalyst for the development by a holistic approach. NITI Aaayog is based on the 7 pillars of effective governance – (1) Pro-People (2) Pro-Activity (3) Participation (4) Empowering (5) Inclusion of all (6) Equality (7) Transparency. In NITI Aayog, the state governments has an equal role in nation’s development process and NITI Aayog promises the principle of co-operative federalism. NITI Aayog is planned as a think tank institution which stands not only as a hub for knowledge but also for good governance. It’s a platform for monitoring and implementation of all government policies by bringing together various ministries at the center and state level. Priorities include upliftment of the poor, marginalized and downtrodden. Empower vulnerable and marginalized sections, redressing identity-based inequalities of all kinds – gender, region, religion, caste or class. Governing Council: Comprising the Chief Ministers of all States and Lt. Governors of Union Territories. Regional Councils: Will be formed to address specific issues and contingencies impacting more than one state or region. Strategy and Planning in the NITI Aayog will be anchored from State-level. Regional Councils will be convened by the Prime Minister for identified priority domains, put under the joint leadership of related sub-groups of States (grouped around commonalities which could be geographic, economic, social or otherwise) and Central Ministries. Have specified tenures, with the mandate to evolve a strategy and oversee implementation. Be jointly headed by one of the groups Chief Ministers (on a rotational basis or otherwise) and a corresponding Central Minister. Include the sectoral Central Ministers and Secretaries concerned, as well as State Ministers and Secretaries. It will be linked to corresponding domain experts and academic institutions. Have a dedicated support cell in the NITI Aayog Secretariat. States would thus be empowered to drive the national agenda. As a consequence, deliberation would be more grass-roots informed, and recommendations would have more ownership, given their joint formulation. Special Invitees: experts, specialists and practitioners with relevant domain knowledge as special invitees nominated by the Prime Minister. Members: full-time: specialists with international exposure. Part-time Members: maximum of 2, from leading universities, research organizations and other relevant institutions in an ex-officio capacity. Part-time members will be on a rotational basis. Ex-Officio Members: maximum of 4 members of the Union Council of Ministers to be nominated by the Prime Minister. Research Wing – that will develop in-house sectoral expertise as a dedicated think tank of top domain experts, specialists and scholars. Consultancy Wing – that will provide a marketplace of whetted panels of expertise and funding for Central and State Governments to tap into; matching their requirements with solution providers, public and private, national and international. 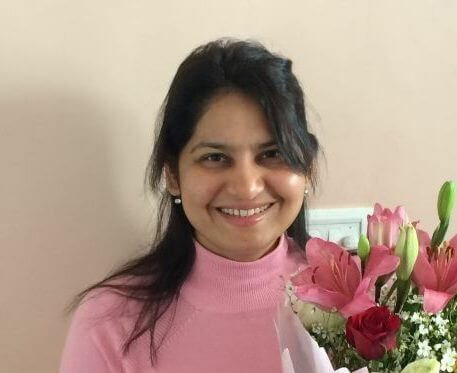 By playing matchmaker instead of providing the entire service itself, NITI Aayog will be able to focus its resources on priority matters, providing guidance and an overall quality check to the rest. Team India Wing – comprising representatives from every State and Ministry, will serve as a permanent platform for national collaboration. Planning Commission – Had deputy chairperson, a member secretary, and full-time members. Secretaries or member secretaries appointed by the usual process. 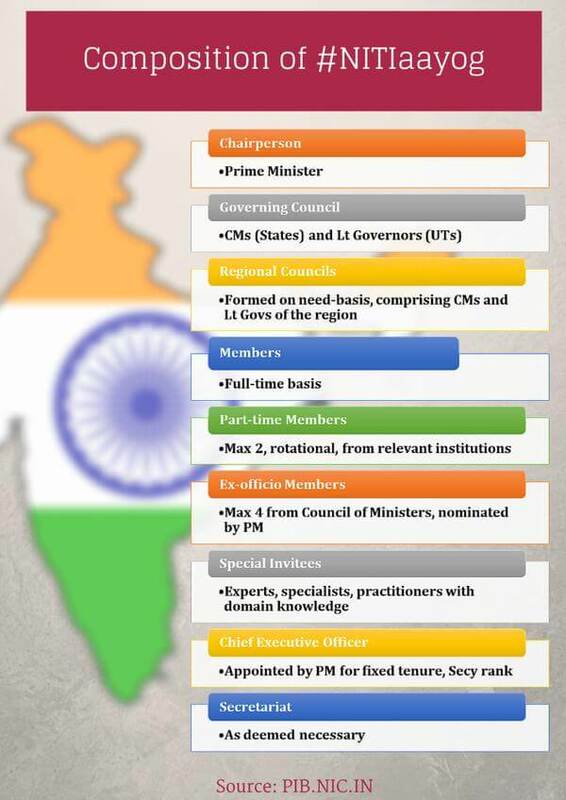 NITI Aayog – New posts of CEO of secretary rank, and Vice-Chairperson. Will also have five full-time members and two part-time members. Four cabinet ministers will serve as ex-officio members. CEO is appointed directly by Prime Minister. Planning commission goes for top-down planning for government with public sector resources. 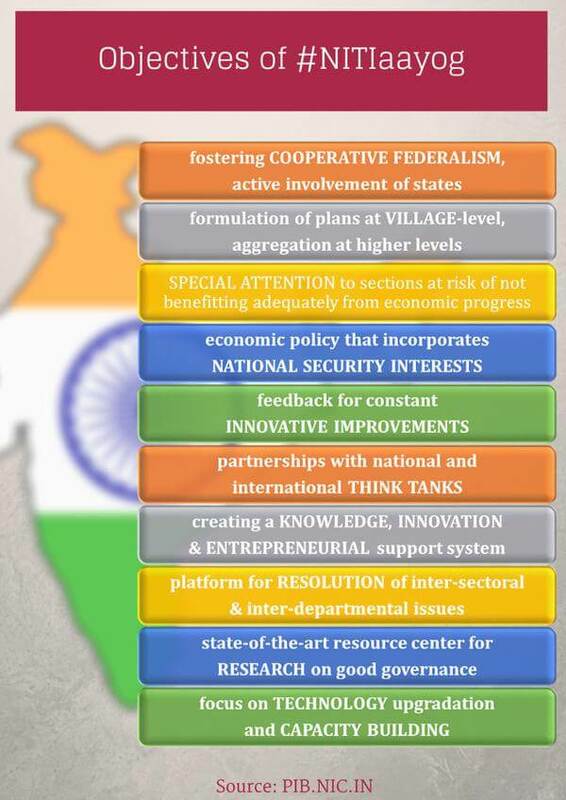 NITI ayog formulate national development strategy in a market economy integrated with the globalized world. The planning commission was a central government institution and no representation of state government. There was no structural mechanism for interaction with states. NITI ayog provides a partnership with state governments to promote co-operative federalism. It provides a platform for structured and regular interaction with states. The role of Finance Commission was greatly reduced with the formation of Planning Commission. Allocation of funds were decided by the Planning Commission. NITI ayog don’t any role in fund allocation. Finance ministry to decide the share of taxes to states, fund allocation to CSS and Union assistance to the state plan. Planning Commission- The commission reported to National Development Council that had State Chief Ministers and Lieutenant governors. Niti Aayog – Governing Council has State Chief Ministers and Lieutenant Governors. Like planning commission, it’s also a non-constitutional body which is not responsible to parliament. Dismantled planning commission without consulting the states. UTs are represented by Lieutenant Governors, not by chief ministers. This is against the principles of federalism. Fund allocation to welfare schemes may get affected. For example, there is a 20 % reduction in gender budgeting. NITI Aayog will function in close cooperation, consultation and coordination with the Ministries of the Central Government and State governments. While it will make recommendations to the Central and State Governments, the responsibility for taking and implementing decisions will rest with them. NITI Aayog will seek to facilitate and empower the critical requirement of good governance – which is people-centric, participative, collaborative, transparent and policy-driven. It will provide critical directional and strategic input to the development process, focussing on deliverables and outcomes. This, along with being as incubator and disseminator of fresh thought and ideas for development, will be the core mission of NITI Aayog. Dear sir.. I’m very glad to tell u that this website and the app provided by u is very helpful for the civil service aspirants. Thanks for giving clear ideas about exam pattern, study materials and books. After reading ur PDF document I got a clear picture about the exam and than i bought all the books u suggested and started preparing for this.. But I’m afried now, because now upsc is introducing a new age limit criteria from 2015. Now I’m already 27 year old, belong to obc cetagory, in the newspaper I read for obc they r limiting age to 28 years, so far i just collected all the materials just now started my preparation. 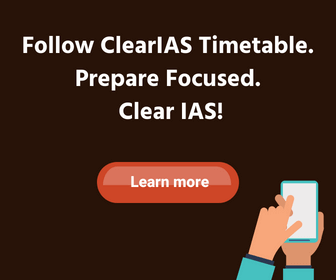 if they do so what’ll going to happen to our dream..
Great to know that http://www.clearias.com and Clear IAS app has been helpful. Don’t worry about age; as of now there are no notiifcation from Government side to reduce age limit. Please search for age limit related posts in clearias.com, so that you get a clear picture. Hello sir !!!! I am a third year engineering student. I want to start my preparations to be an IAS officer. But I am quite confused about from where to start ? please guide me !!!!! Dear website handlers u r doing great job.the website is very useful for working professionals like me.one think I want u to update please discuss Hindu editorials and also add prioritizing subjects and topics for effective combined preparation of mains and pre.I can’t afford coaching.and also discuss writing skills technics for mains and also add preparation technics for pre paper 2.once again thanks a lot…..
sir in this article you have written that planning commission started in 1952. but in article “FROM PLANNING COMMISSION TO NITI AAYOG : EVOLUTION OF INDIAN PLANNING” DATED april 6 2015 you have written that it was started in 1950 and also first five year plan was implemented in 1951.I CANT UNDERSTAND IT. @Akash: Corrected. Thanks for pointing out. (UTs are represented by Lieutenant Governors, not by chief ministers. This is against the principles of federalism.) — Kejriwal is also part of Niti Aayog. me that what sub should i choose for mains ,,except commerce.